A single adjustable orifice air wipe will generally cover the complete range of diameters produced by one extruder. This makes it unnecessary to remove and replace complete wipe assemblies for different extruded products (as is the case with other manufacturers’ air wipes). The amount of water carried forward by the extrusion, and the ratio of air wipe orifice size to material diameter, are factors in establishing the speed limitation. Experience indicates a practical operating speed of up to 350 metre per minute under reasonable conditions. The air wipe is installed after the water trough on the extrusion line, with the extruded material moving through at a right angle to the mounting face. The unit is usually mounted with the airwipe “wheels” one above the other, and with the hinged wheel uppermost (so that gravity will close the unit should it open due to the passage of lumps). However, if required, the unit can be mounted horizontally and a coil spring used to effect the closure after the passage of lumps. As the cable moves through the airwipe, the air jet surrounds it and strikes at an angle blowing the water from its surface back upstream. When a knot or lump on the extrusion passes through, the upper airwipe half will ride over it and then return to its normal position, allowing safe passage. The numbers on the face of the wiping heads indicate the largest extruded diameter which should pass through at that particular setting. Larger diameters will pass through, but with reduced clearances the movement or sagging of the cable would cause wear of the wiping heads. To position the heads, unscrew the wing nuts and pull the heads away from the bracket. Turn the heads until the required cable diameter numbers coincide, then feel for the location and re-tighten the wing nuts. As supplied, wheels are located on the left side of the frame mounting arms (as viewed from the exit end) for use in a left to right direction. Locating pins in the upper and lower wheel spindle assemblies, which mate with holes in the frame arms, permit the wheels to be replaced on the opposite side, while retaining the exact angle of the air jets to ensure optimum wiping action. The direction at which the air strikes the cable is determined by the initial setting of the wiping head hub on the bracket and swing arm. 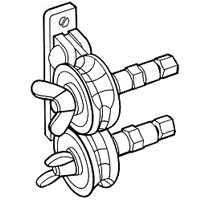 Additional locating pin holes are provided in the bracket and swing arm to allow the repositioning of the spindles and air jets when cable travels in the opposite direction. For vertically moving wire or cable, Marldon can supply a coil spring to keep the two wiping heads together. Should dirty air clog the slits, these air wipes can be disassembled easily for cleaning. If the extrusion is permitted to drag on either wheel, it will eventually cause grooving of the surface. The wiping heads have eleven variable positions arranged to accommodate extrusions from approximately 2mm diameter minimum up to 12mm diameter maximum. Manufactured from stainless steel. The air consumption varies for each extrusion size from .08 to .23 cubic meters/min. (3 to 8 cubic feet/min.) if used at 5.6Kg/cubic meter (80psi). The wiping heads have eleven variable positions arranged to accommodate extrusions from approximately 3mm diameter minimum up to 22mm diameter maximum. The air consumption varies for each extrusion size from .14 to .34 cubic meters/min. (5 to 12 cubic feet/min.) if used at 5.6Kg/cubic meter (80psi). The wiping heads have ten variable positions arranged to accommodate extrusions from approximately 12mm diameter minimum up to 65mm diameter maximum. Manufactured with non corrosive alloys and stainless steel brackets. The air consumption varies for each extrusion size from .35 to .71 cubic meters/min. (12 to 25 cubic feet/min.) if used at 5.6Kg/cubic meter (80psi).